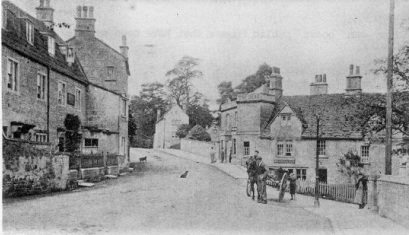 The Bear Inn where Dr Martin broke the bedroom window. Going back in thoughts to the early part of 1900, for I myself was born on Kingsdown, Box, Wilts in a small cottage on the top of Wormecliffe Lane, and I was born on February 9th 1906. And I learnt as time went by of a wonderful Doctor Martin from Box village coming on his lovely horse to bring me into the world. This Doctor Martin was a rich gentleman and had a lovely large house built across the road from the Bear Hotel. And there were grand stables built for his many horses. A Mr. George Hinton was the head groom for Doctor Martin and worked long hours every day, and at night time Mr George Hinton’s home was at Henley Yard, so quite a long walk home, and he had to be back down the stables again by 6am each morning. Doctor Martin was not married but had a house keeper whose name was Miss Fishlock. Now came the year of 1911 and July 29th our Lot was born and that was on our Sister Mary’s birthday. Again up rode good Doctor Martin on his lovely horse and that was near about 11 pm. Mr George Hinton always had Doctor Martin's saddle and doctor bag on a pulley over the horse that Doctor Martin would be riding on the night of the callout. Now at that time there was only one doctor for the whole of Box, Box Hill, Quarry Hill, Washwells, Henley, Kingsdown, Ashley, Middlehill, Shockerwick, Alcombe, Ditteridge, also Colerne and every house and farm in between. Now this wonderful doctor brought every baby into the world that was born in these places including myself. Very few people ever went to a hospital because whatever trouble one had this wonderful doctor could put right. You could break your leg, arm or whatever and he would set whatever limb it was and you stayed home until it was all well. He would also pull out anybody's teeth if you let him. He gave nothing for the pain. Very few children would ever let him know they had toothache, rather put up with it. Anyway he was wonderful, and turned out night and day on his horse. This doctor had several horses in his stables and a groom to look after them, and before the groom went home at night he would fix the doctor's saddle up over the horse that was being used that night on a pulley. The doctor's bags were always strapped to the saddle. So in the night when the doctor was called out he only had to pull a rope and the saddle came down on the horse's back. He just had to girth up and put the bridle on and he was away crossing over fields, the nearest cut to wherever he was going. He always tied his horse up to someone's gate, the nearest one, it didn't matter whose it was. They say anyone that was really poor and most of the folk around were, then he never sent them a bill. I think he was rather rich himself, for when he went to Box first, long before my time, he had rather a large house built with a long drive, and big garden and lovely stables for his horses. He was not married. There was a housekeeper one saw when you were sent for medicine which the doctor made up for the folk that needed it. The saying goes that while he was waiting for his house to be built he took a room at the Bear Hotel across the road from where he was having his house built. And it was when he went into the bedroom he found the window would not open. He called for someone to open it, but the landlady said, Oh the window, don't open it Sir! The next thing was the noise of breaking glass and the doctor calling to the landlady to fetch his jackboot in from the road.Though of course every expectant woman sort of booked up a midwife and the lady that saw to most mothers when their babies were expected was a lady that lived at Totney Corner in a small cottage down over the back. And her name was Mrs. Stiles, her own family were all grown up and away from home, but Mr. Stiles was home but working each day at some job down at Box. Of course apart from the midwife, the wonderful Doctor Martin of Box attended every birth for miles around and that was Box Village, Box Hill, Wadswick, Chapel Plaster, Kingsdown, Longsplatt, Henley, Middlehill, Shockerwick, Colerne and every outlying farm around. And every visit was made on horseback, for Doctor Martin had many lovely horses, and Mr. George Hinton was Doctor Martin's groom. And Mr. Hinton lived at Henley Yard, so quite a long way away from the stables, but then in those days grooms worked very long hours, and it may be 10 or even 11 o'clock at night before one was able to go on home, only to be back in stables again by 6 o'clock next morning. [Many people know of Dr Martin who practised in the parish for over 50 years until he retired in 1931. Do you remember him? Perhaps you recall what health care was like in Box before the National Health Act of 1948? What sort of medicines were prescribed?